The line between being a loud & proud responsible food consumer and grossing out friends with roadkill stories is thinner than a highway center line. I’m not a hunter, so it was an adventure to scout for, dress and eat a vehicle-slaughtered deer. But that process opens up a whole can of worms (by the way, worms are a very bad sign when harvesting roadkill) about food philosophy. First off: I’m not a redneck. 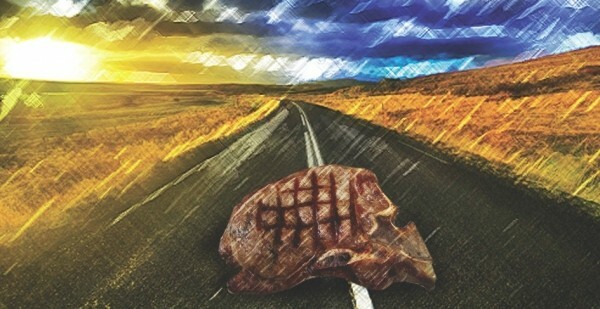 Moving on: The thought of getting and eating roadkill is initially gross, but all store-bought animals were slaughtered, and when you know the tell-tale signs of good, fresh roadkill, it’s safe. It’s illegal without a permit from the Utah Division of Wildlife Resources, although sometimes you can report the animal to local authorities and have it “donated” to you. The animal will otherwise go to waste, so why not use the food? I’m not talking Lion King circle-of-life stuff here—just free meat. So, one January night in 2009, I was riding with my friend Scott on Highway 40 after a shift as wilderness guides. In the trunk: a cooler, tarp and sharp knife. For a month, we had been on lookout after a co-worker and primitive-skills expert, Summie (he could eat a whole summer-sausage log in one sitting), suggested the idea. It seemed primal. People actually do this? Speeding westward, Scott’s eyes widened. After a sharp U-turn, we drove back 300 yards. It was freezing out—that helps maintain freshness. Scott, formerly a hunter, looked at the deer’s eyes first. If opportunistic birds haven’t eaten them, and they aren’t cloudy, that’s positive. When tugging the hair, tufts didn’t clump off—if they do, that’s a bad sign. Obviously, bloating is a no-go. We had a winner. Somehow, I imagined the salt & rust blood smell to be more potent—more consuming and visceral—and the process to be more rigorous. As I assisted, it took little more than 15 minutes. The delicious roadkill-deer chili we made later took much longer.